Sometimes you have to be in the right place at the right time. 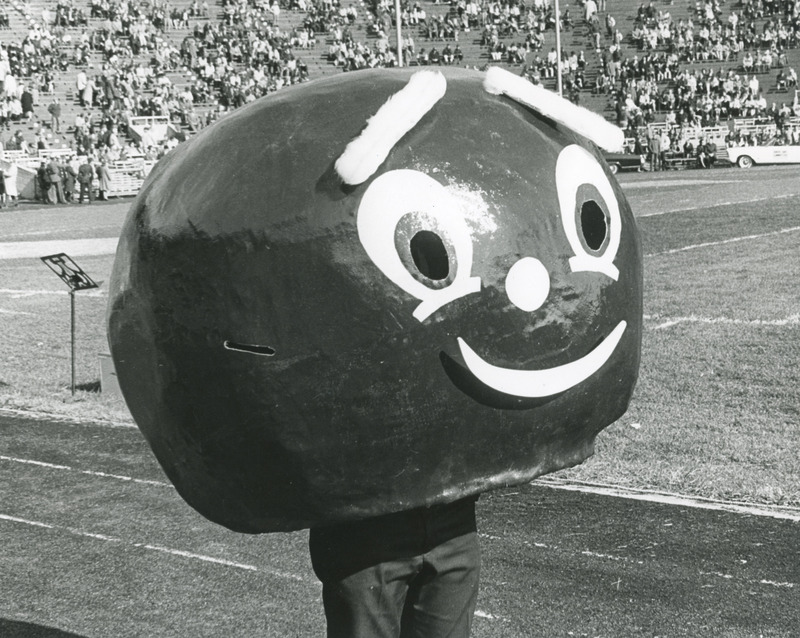 It seems that Mike Caporal was just that when it comes to Brutus Buckeye. For years, Mike Caporal’s role with Brutus was unknown. 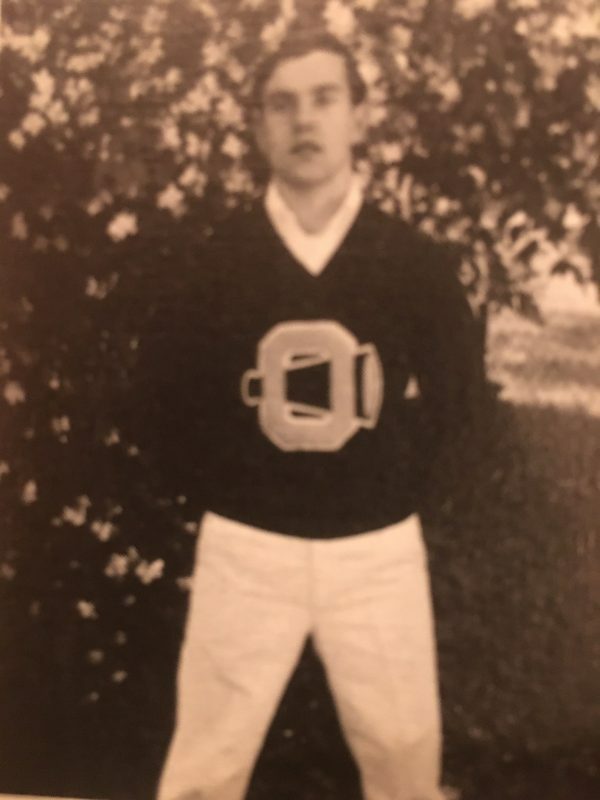 Mike, a Sigma Chi, lived in the Stadium Scholarship Dorm down the hall from cheerleader Tom Blackstone, who encouraged him to try out for cheerleading. Despite having never been a cheerleader, but drawing on his skills in tennis and football, Mike went to Spring 1965 tryouts. He made it–almost! He was an alternate on the squad in Fall 1965 when many of the female cheerleaders were Pi Beta Phis. 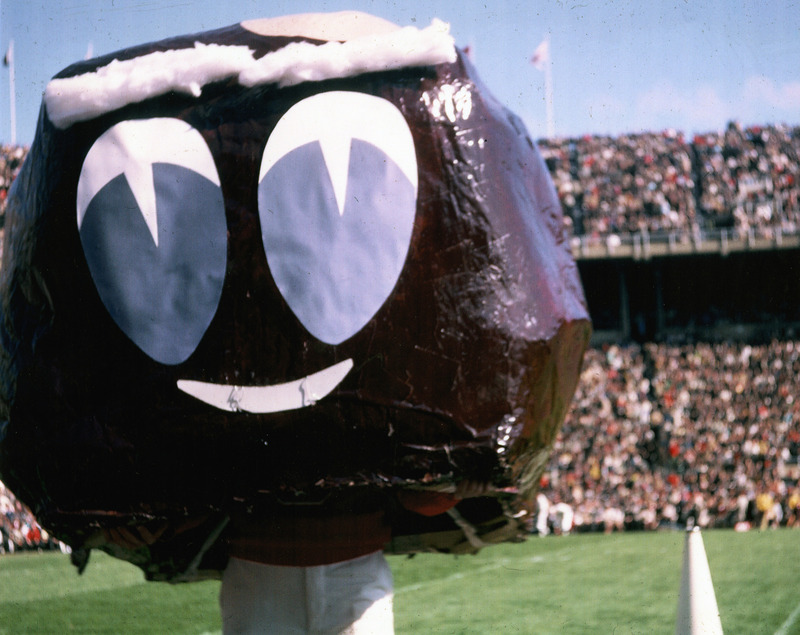 It was possible that when the papier-mâché version of Brutus was created on the Pi Phi lawn in October, 1965, that Mike knew about it and the Pi Phi cheerleaders might have enlisted him to wear the first head. Or fellow cheerleader Keith Kistler, who was also an Ohio Stater, the organization to which Ray Bourthis, co-creator of Brutus, was on provisional status, may have involved Mike. 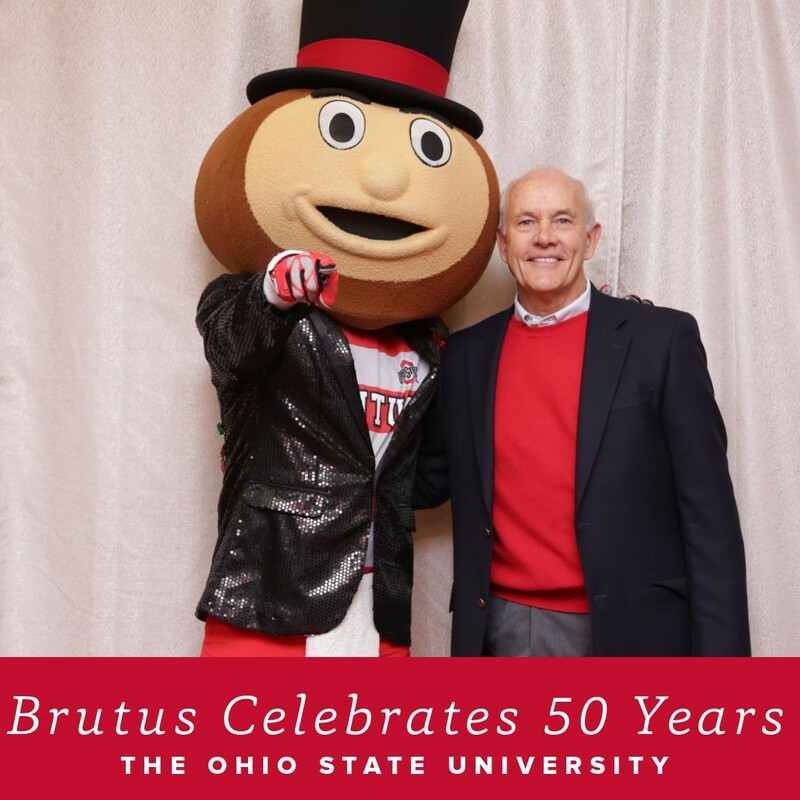 When people asked me, the other co-creator, who wore the first Brutus head, I said, “I don’t know.” And I didn’t, until the 50th Celebration for Brutus when I met up with Mike and his wife Ginger. At that time, I realized that Mike had worn at least one of the 1965 Brutus heads, but it wasn’t clear whether he was the First Real Brutus. Was Mike the papier-mâché Brutus? or the fiberglass Brutus? or both? Mike recalls that he wore the head, whichever one it was, only during football time outs. The head would be sitting on the track surrounding the field and he would go put it on. With limited visibility out the eyeholes or looking down at his feet, Mike relied on his fellow cheerleaders to say where he should go. To arouse crowd reaction, Mike would move the eyebrows up or down using dowels inside the head. There again, he had to rely on the other cheerleaders to tell him which way to move the sticks. When at rest, and still with the head on, Mike remembers squatting in front of the band, whose members would yell at him to move. They couldn’t see the action on the field over his bulk. Mike and I reminisced about people we knew in common besides the Pi Phi cheerleaders and Tom Blackstone, who played flag football with my first husband. Mike had played football at Dayton Chaminade with Don Unverferth, who was quarterback at Ohio State during the early Brutus years. Don, coincidently, was dating and later married, Becki Niuman, the Pi Phi who helped me make the papier-mâché Brutus head. 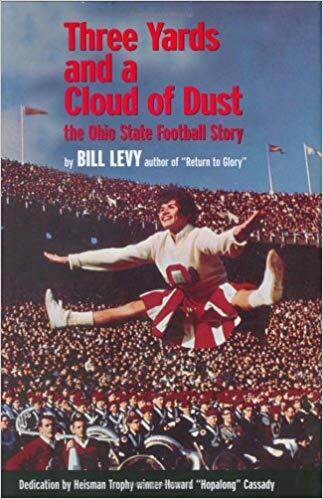 Mike said, “Don threw a bullet pass,” which wasn’t fully appreciated in Woody Hayes’ era of “Three Yards and a Cloud of Dust.” Coincidentally, Mike and fellow cheerleader Dave Berry made it on the cover of the book with that name. Mike is the cheerleader in the lower left corner of the book cover. Mike and I shared at least one thing in common besides friends. Neither of us thought to submit our association with Brutus to Makio, the school yearbook, for activities listing. As Mike says, “No one knew it was going to be a cool thing.” Besides cheerleader, Mike was in the Gold Digger King skit for Tom Blackstone. We were also both involved in the Name the Mascot contest, but in slightly different ways. I was in the judging room on Friday, November 19, as a silent partner, and Mike was sitting outside the room. At one point, Mike recalls that head judge Beanie Drake, Ohio Staters advisor, walked out of the room and said to him, “We’ve narrowed it down to three names, Bobby, Buckey and Brutus. What do you think?” Mike responded, “Brutus.” It sounded more ferocious. Mike and his wife Ginger, an Ohio State Kappa Kappa Gamma, went for the southern lifestyle after his military service in the Air Force. He practiced general dentistry in Virginia, then Charlotte, NC, before retiring to tennis player’s paradise, Hilton Head Island. For years, the list of official Brutus alumni did not include Mike Caporal. It wasn’t until Brutus’s 50th Celebration in 2015 was on the horizon that Mike got any notice. As he recalls, someone from Hilton Head, possibly a member of the Board of Trustees, who knew he had been an early Brutus, made the contact. The good news is that Mike was invited to the weekend celebration and was honored on stage and on the field with the other Brutus alumni. He had always been on the Cheerleading alumni list, but was now on the more exclusive Brutus list. Will the Real First Brutus Please Stand Up? Mike and two others pop up and sit down like trumpet keys, then finally, after long camera pauses, Mike stands up to claim his status. The proof: a short article in the November 9, 1965, The Ohio State Lantern, “One additional cheerleader will be chosen to ‘inhabit’ the buckeye. Cheerleader Caporal wore it during halftime ceremonies at the homecoming game.” Wild applause. As the years rolled by and Brutus became more famous, Mike enjoyed some local notoriety. Patients would ask to have pictures taken with him and seek his autograph. 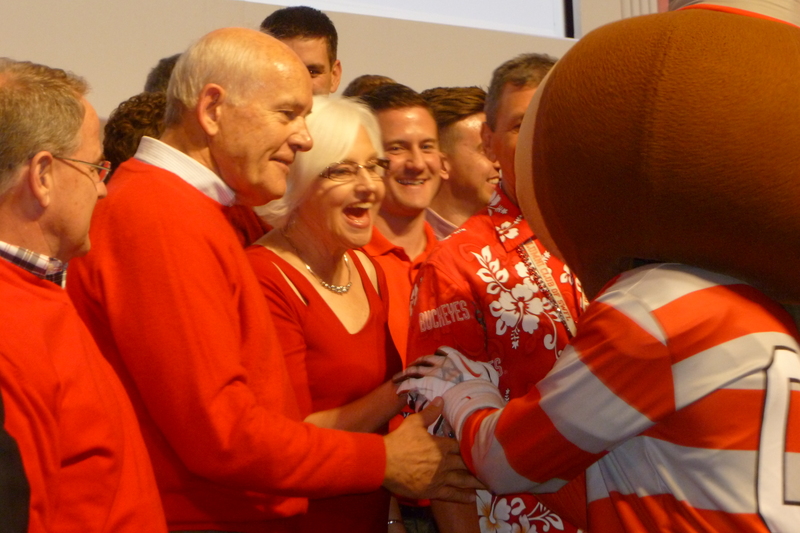 Mike was in the right place at the right time in 1965, and now he is finally being celebrated by Ohio State as the first to wear the Brutus Buckeye costume. 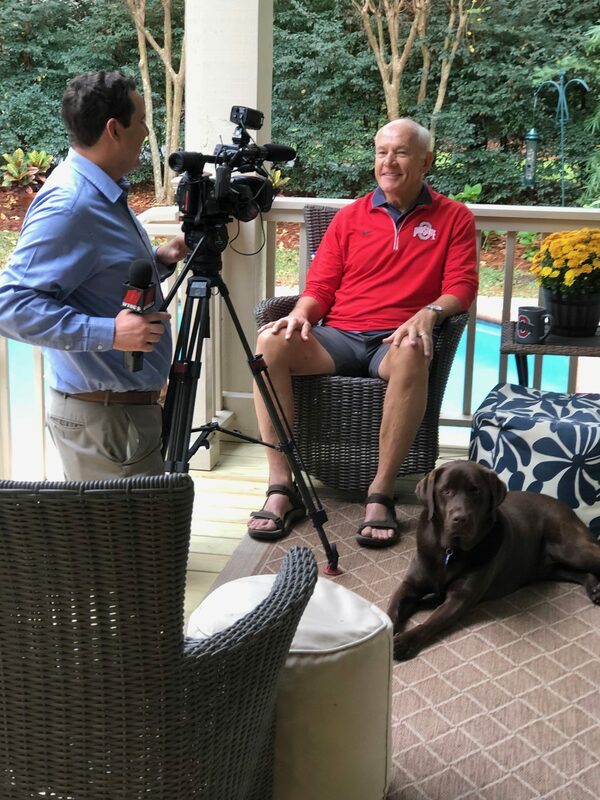 On November 8, Mike was interviewed by a CBS affiliate for an upcoming piece by Kevin Landers, WBNS, Columbus, to air prior to the BIG game on November 24. Bravo, Mike! Mike Caporal; The Ohio State University Archives; The Lantern, the student voice of The Ohio State University; Sally Lanyon; and special shout out to Jim Baer, BME 1969, for what may be ONLY existing photo of the papier-mâché version of Brutus.